Welcome to the Glass World®! A wondrous place of magical colors and unique glass characters. There are four wacky families called the PeePs™, BunEEz™, tOObz™ and the Wa2C™. You'll love the crazy names and zany bios each one has. It's a world of diamond mountains and crystal castles populated with miniature glass creatures! It's a place that will excite your senses and reflect a rainbow of colors and fun into your world. The Glass World® has its own home on the web which you can visit at glassworld.com. Abima™ is out of control! He’s got his hand in the cookie jar, and his mind on the next adventure, which is probably going to involve bouncing off the walls and knocking over expensive stuff. He only knocks over the expensive stuff. Not to worry though. Abima™ is very protective and would always watch out for you. Are you scared of the dark? So is Abima™! Oh. Anyway, Abima™ loves to visit his favorite cousin Wage™. They look like they could be related, right? Maybe he’s your cousin too. Ice-Bat™, comes from an Ice Cave and loves hiding inside Ice Chests. Everything he touches turns to Ice...yet profoundly he warms your heart. Ice-Bat™ thinks you are cool and he wants to chill with you. He wants to hang out with you...or just hang upside-down, if that's OK with you! 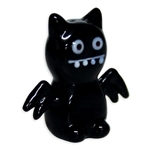 Ice-Bat™ is there for you when you feel like you may be losing your cool, or feeling like a fool. Don't panic! Don't stress! Grab Ice-Bat™ and put him to the test. What kind of name is OX™? No, not like the animal... OX™, as in HUG and KISS! How can he hug you with such short arms? OX™ uses his ears! He's not a very good listener, but he puts his ears to good use in many other ways! OX™ is great at magic, and his best trick is turning your stuff into his stuff. His best buddy Wedgehead™ calls that stealing, but OX™ just wants to borrow things from you for a few hundred years. He promises to put everything back when he's done. What he wants to steal most are kisses, whether they’re in the chocolate variety or just plain, and he promises to be your friend if you would lend him a hand, or an ear...or like Two Dollars! 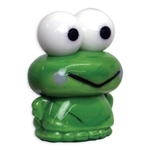 Keroppi lives with his brother, sister and parents in a big house on the edge of Donut Pond, the largest and bluest pond around! 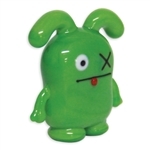 Keroppi and his friends share his love for playing games, especially baseball and boomerangs. 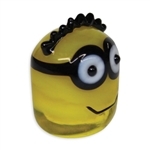 Carl is a lovable character from the hit movie, Despicable Me 2! 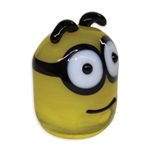 Dave is a lovable character from the hit movie, Despicable Me 2! 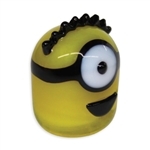 Jerry is a lovable character from the hit movie, Despicable Me 2! 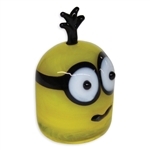 Kevin is a lovable character from the hit movie, Despicable Me 2! 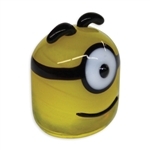 Stuart is a lovable character from the hit movie, Despicable Me 2! Tom is a lovable character from the hit movie, Despicable Me 2!